City, along with Gozan, Haran, and Reseph, which Rabshakeh mentions as having been conquered by Sennacherib's predecessors (II Kings xix. 12; Isa. xxxvii. 12). This city was inhabited by the Bene 'Eden. The cuneiform inscriptions mention a Bit-Adini, located in the upper Mesopotamian country, which may be identical with the Biblical place. "Telassar" is probably, as Schrader holds, the same name as "Til-Ashshuri" (the hill of Ashur), and may have been given to any place on which a temple was built. One such place is found east of the Tigris, as shown by Schrader; and another, mentioned by Tiglath-pileser III., was probably in Babylonia. Esarhaddon, too, mentions one near the land of the Mitanni. 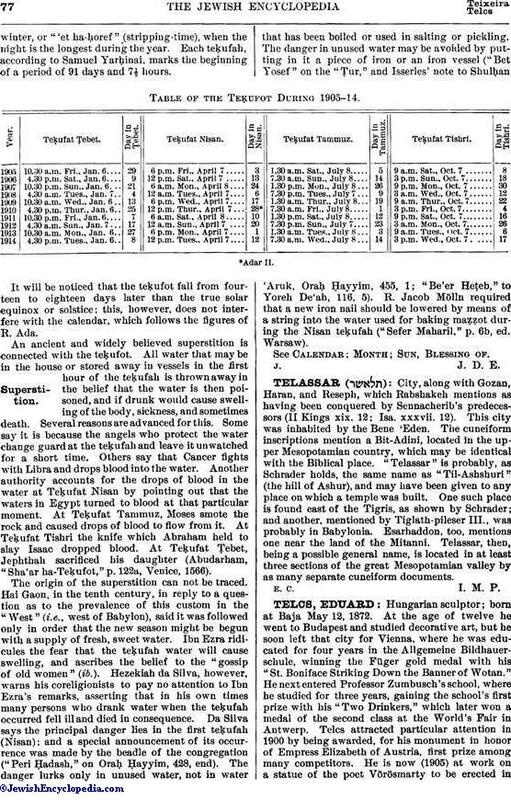 Telassar, then, being a possible general name, is located in at least three sections of the great Mesopotamian valley by as many separate cuneiform documents. E. C. I. M. P.